Permalink Submitted by Anonymous (not verified) on May 27, 2010 - 2:11am. I disagree on many points here. For one you need to understand how public libraries were originally formed, not by governments or Carnegie, but Women's clubs and people who cared about their community. Furthermore, those losing their jobs aren't the cranky dinosaurs, but the fresh shoots. Just as we are going to make progress those are the ones that lose their jobs. I'd use a person in paticular as an example, but I won't. Also, you do need a seperate property tax that politicians can't touch. They do that in many states and in California. It needs to be more, but right now everyone is getting hit hard it isn't just libraries. I agree with you about the lack of leadership. Many directors just rested on their laurels and didn't do enough when things were good, thusly their predicaments are worse than others. I will add more, but should think about this more. Permalink Submitted by Anonymous (not verified) on May 27, 2010 - 5:11am. I too disagree with your point about library closures to improve the quality of staff. This could be achieved in a number of ways, to develop the skills, understanding and mindset of staff already working in libraries, rather than axing public services and punishing the public because of poor quality recruitment in the past. Closing libraries not only results in redundancies, but poor morale for the staff who are left behind. Even if they started off motivated, with the ability to advocate for their library, they will become less and less able to do so with every library closure. 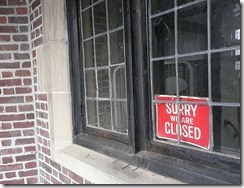 Besides, it doesn't take the physical closure of a library to replace a member of staff. We also need to focus on ensuring that we have strong leaders and capable new staff entering the profession. The responsibility at the beginning lies with library schools. Mine does teach skills like managing personalities, change management, conflict resolution and social diplomacy. The responsibility then lies with the library authorities, who need to choose the right people for the jobs and make sure they have the support and encouragement they need to keep doing so. This hasn't happened, in so many cases. With fewer libraries, libraries will not be able to generate effective advocacy. The idea that the survivors will feel the need to justify their existence and suddenly develop the skills to do so is flawed. I disagree that closures are the only way to create positive substantial and lasting change. The removal of a service, however flawed, so that librarians can get their acts together, sets the wrong tone. It is not the right thing for the profession to decimate its own by forcing them out of the profession or to seek work elsewhere. It is the right thing to nurture development and change, reminding people of why they do the job they do and why it is so important. That can be achieved without devastating losses to the public and library staff. Permalink Submitted by AndyW on May 27, 2010 - 7:24pm. While I see your viewpoints on some of my main points, my only objection is to the notion that removal of service sets the wrong tone. It may take the actual demonstration of the removal of the service to get the community (both librarians and the people served) to think about what the library as an institution means to them. There cannot be this "we cannot live without libraries" mantra without the preparation for such a circumstance; it denies the reality and its potential beneficial outcomes. It may appear to set the wrong tone in the short term, but I'm in this for the long run. Permalink Submitted by Anonymous (not verified) on May 27, 2010 - 6:40am. Please look up the difference between "less" and "fewer". You undermine your argument with incorrect grammar. Permalink Submitted by Anonymous (not verified) on May 27, 2010 - 9:30am. Important thing to remember: Only thing worser than bad grammar is a grammar nazi. Permalink Submitted by effinglibrarian on May 27, 2010 - 10:23am. I knew the difference between less and fewer. Permalink Submitted by AndyW on May 27, 2010 - 7:10pm. I used "less" as opposed to "fewer" because I wanted to juxtapose it against the title which uses the word "more". Unless I'm mistaking that the comment was directed at the poster above and not my post, because it's kinda hard to tell that way people reply to posts on here. Permalink Submitted by Anonymous (not verified) on May 31, 2010 - 9:48am. Permalink Submitted by Anonymous (not verified) on May 31, 2010 - 12:31pm. "Oh no. Poor grammar is unforgivable when used in an artcle written by a librarian"
You defence of proper grammar is greatly weakened by your lack of a period and the misspelled word. Permalink Submitted by Anonymous (not verified) on May 31, 2010 - 1:39pm. Yes, and your misspelling of the word 'grammar' in the subject line weakens your reproach on the other commenter. Permalink Submitted by Anonymous (not verified) on May 31, 2010 - 4:53pm. The use of "less" instead of "fewer" jumped out at me and I immediately took the article less seriously. Bad grammar and spelling make me distrust the authority of the writer. Permalink Submitted by Anonymous (not verified) on May 31, 2010 - 7:06pm. Permalink Submitted by Anonymous (not verified) on May 27, 2010 - 8:54am. 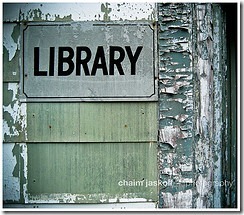 I'll just point out that some of the best and most innovative public libraries have been hit the hardest by the cuts. Permalink Submitted by Anonymous (not verified) on May 27, 2010 - 9:58am. The part about customer service really hit home for me. I've gotten mediocre customer service at best from my local library staff. In some cases, I've received downright rude treatment from the ILL coordinator for daring to ask a question on why they can't change their highly restrictive ILL practices. This library wants to expand, claiming that they need more space, but through their past behavior, have antagonized the community. It's not me, but others who have commented on how hard it is to volunteer there. From what I have heard, the prior director was there until she died and wasn't the most progressive or innovative librarian. Her hiring decisions were questionable as well. I agree that libraries need to look at how they hire paraprofessional and staff positions. They need to start looking at outside applicants and quit promoting under qualified staff members for more technical positions. I had applied for a library technician position at my local public library, but did not even get an interview. A current library aide got the position. I know that I was qualified for the position due to my education and library experience, probably more than she was. The library director and city HR person would not consider hiring an outside candidate when the library director had an internal candidate in mind. That attitude is why many under qualified individuals keep their jobs when there are plenty of qualified outside candidates who could do them. If there is an expansion or new building, I want to see some change in the libraries' policies to make it worth the expense. I want to see them get rid of the six month embargo on ILL requests for new books. I want to see them have a more active collection development policy or at least buy some more new books closer to their release dates, not two months later. I want to see that they are more open to members of the community volunteering their time and talents. I also would like to see a more transparent and open hiring policy. Unless some of those things happen, then I am against a new building. Permalink Submitted by Anonymous (not verified) on May 27, 2010 - 10:53am. "I had applied for a library technician position at my local public library, but did not even get an interview. A current library aide got the position. I know that I was qualified for the position due to my education and library experience, probably more than she was. The library director and city HR person would not consider hiring an outside candidate when the library director had an internal candidate in mind. That attitude is why many under qualified individuals keep their jobs when there are plenty of qualified outside candidates who could do them." I might sound a bit naive, but sometimes in-house hiring/promotion is a good thing. Look at it from the other side. This "library aide" might be qualified with the right set of skills and is a hard worker, but gets passed over for someone who has no knowledge of this particular library. Getting passed over for an "outsider" is rough and often happens. For example, is it better to hire in-house the person who did ILL on back-up status when the regular ILL librarian was out sick/vacation/etc--a person who doesn't require any extra training--or hire someone from the outside who will require training and familiarization with the library's policies/city employee rules/etc.? You just come across as bitter about not getting the job. As you indicated, you don't truly know what experience or qualifications the library aide had. You said you "probably" had more than she did. Probably is not definite. For the "transparent" hiring policies you want, look to your city goverment. As most public libraries are City departments, hiring policies stem from your city's HR department. Does your city have "transparency" in its other departments? I'm a bit confused about the ILL 'restrictions' you mentioned. Are those about not loaning your library's new books out to other libraries or not allowing you to request new books? I understand many libraries have ILL policies about not loaning out their own new books to allow their patrons (the taxpayers who paid for the books) to have "first chance" at them, often because new releases are in high demand. They do this because the library's first responsibility is to their own taxpayers and supporters. I don't know of any libraries in my area that restrict patrons from attempting to see if another library would loan a new book. I mean, there's no harm in trying--the worst that can happen is the ILL request goes unfilled. So, if it's the latter, take that up with your particular library board. As far as library getting new releases on time, back orders happen. If you have a basic understanding of how libraries purchase books, then you would understand that sometimes libraries get passed over when there is high demand for certain books. I know of one particular political book that was in such huge demand that it took my library four months to receive our copy. The particular company we ordered it through was supplying bigger libraries and bookstores first, so our solitary copy was placed on back order. The last part about volunteers is often true. It is hard to volunteer because, at my library, there are only menial tasks that can be done, in part to library board/city policies not allowing volunteers to have access to patron information. And to find someone with the proper skills to shelve books or shelf-read is a lot harder than you think. Does your library have a Friends organization? If people want to volunteer, that would a be a really good place to start. Friends organizations do a lot to help libraries, from programming to fundraising to advocacy. Permalink Submitted by Anonymous (not verified) on May 27, 2010 - 3:22pm. The ILL restrictions are for six months on ALL new material, not high circulation items and bestsellers. I can understand up to three months for most materials, but six months seems excessive. I can see the six month embargo for high circulation items and bestsellers. I do know how libraries order books. I took some library science courses as part of my minor, including one on adult popular fiction. At most, it orders three copies of bestsellers and titles by certain authors. There's some titles that you would expect them to order in advance so they're ready to check out on or near the release date, but the recent Jodi Picoult the only one I've seen in the library week of release. I do think they put more focus on getting DVDs close to their release dates, which is a plus given the delayed releases on Neflix for many titles. I wish that spirit would extend to getting new books into the library sooner. I am still bitter that I didn't get the position. I worked in my university library during college doing everything (ILL, processing, customer service). At the time I did not get this position, I was unemployed. I'm employed part time now, but am still looking for a full time position with daytime hours. I know a number of public libraries use the civil service exam as part of their hiring process. That is a wonderful idea to me after this experience. It removes the aspect of perceived favoritism towards internal applicants and as long as the external applicant can pass the exam, then they have an equally fair chance at getting the job. Permalink Submitted by Anonymous (not verified) on May 27, 2010 - 3:59pm. Still a bit confused about ILL. Is it on materials your library owns or on materials you would be requesting from other libraries? If the former, I can understand as the reasons I stated previously. If the latter, I would talk with the ILL librarian, the director, the library board for a reason why. It makes no sense to me. My library lets our patrons know that we have to abide by the loaning libraries policies, and we specifically tell patrons looking for newer releases that the request might not be filled based on that. The purchasing of books--namely the delays in receiving the books--are mostly out the the library's hands. It's in the hands of companies that are trying to make money. As I said back orders happen. Not often enough to be a major problem, but still a minor inconvenience. Also, I know many of our new releases have waiting lists well in advance. Patrons can submit a request for a book even before it is released, and when the books are processed into the library the patrons are added to the waiting list in the computer system. Thus, many new releases never hit the shelves for the first several weeks. One example, our copies of The Da Vinci Code were out for a whole year because of the extended waiting lists. A year before they hit the fiction shelves! Is it possible this is happening? Or is it a lack of ordering in advance? Ask for their collection development policy. I do wish you the best of luck in dealing with this library and in finding a full-time position. To relate this back to the original post, I will say as another commenter did, that all libraries are structured differently based on their cities, counties, and states. Policies will be different for various reasons. If you have problems, such as the ones listed above, it isn't that their is a problem with libraries as a whole. It is within your own particular library and doesn't necessarily mean that there is a flaw within the idea behind public libraries. Permalink Submitted by Anonymous (not verified) on June 1, 2010 - 12:21am. Thank you for your wonderfully worded reply. I love the idea behind public libraries. I had wonderful experiences with them in Illinois and Michigan, even with the budget cuts that have happened recently. I was able to get new releases within a month of street date via ILL in Michigan because some libraries did not have embargoes on lending new materials. They had this policy because most of each district/public (the wording varied in MI due to the source of the funding) libraries wanted to provide the best service for their patrons. That included including all material except for high circulating items in MELCAT, the state's ILL system, which replaced the regional systems. 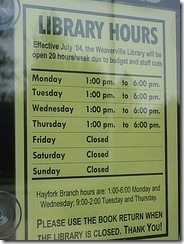 It saved individual libraries money on purchasing newer items that could be gotten via ILL, especially in rural areas. ILL is an integral service than any can provide, especially in times where many local libraries have a limited collection development budget. It allows them to provide new materials to their patrons who like to read without having to buy the new materials for each individual patron's taste. It allows newer items that are simply sitting unread on shelves to be enjoyed by patrons in other locations. Permalink Submitted by Anonymous (not verified) on May 27, 2010 - 4:49pm. Just remembered this and it might help. Our library had several standing orders for certain authors. Long story short, a few years back, there was major politicking and blustering by the city manager and ALL standing orders in ALL city departments were cut. So, our ordering librarian had to manually submit orders for the Danielle Steel, Nora Roberts, James Patterson plethora of books. And all pending orders had to be approved by the city manager before they could be submitted to the companies involved. Depending on the book companies' order policies, they may fill standing orders first. So, our library would get our copy later than usual. I mention this because, in part, it came from the city manager trying to control or cut spending. 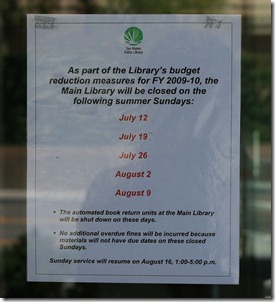 This might be relevant to your library, especially with budget cuts and closures happening more and more frequently. Taking some library science courses, or even working in a college library, doesn't necessarily mean that you are familiar with all that is involved in the way public libraries handle city funds and what restrictions they have on those expenditures. When you add in budget shortfalls, ordering can get trickier. We've run out of money for book orders and supplies before the fiscal year is over. It becomes about being savvy enough to get the majority of the materials your patrons want, so maybe some books are not bought until the new fiscal year. Perhaps. There is way more to how libraries work and how they interact (and sometimes struggle) with their governing bodies--city, county, state, local library board, state library department, and even the federal government than most patrons realize. The key is to ask questions, became familiar with the policies, find reasoning behind the policies, and ultimately find solutions to the problems. Permalink Submitted by Anonymous (not verified) on May 27, 2010 - 10:23am. I disagree with the characterization of libraries as backward, monolithic institutions that do not try new things, have dreadful customer service and horrible leadership. If it exists, it is more the exception than the rule. Libraries have changed a great deal in the past two decades and in fact it is that willingness to change that has helped us to survive. The author calls for a "macro debate" and serious discussion about the future of libraries as if there is some universal solution. As if 50 of the best librarians will come out of it saying "eureka!" with some perfect path for everyone. None exists. Libraries are funded and structured differently from city to city, county to county and state to state. What may work in one community would be horrible in another. Yes libraries need to communicate, share solutions, policies and ideas. But to sit around and contemplate the "vision" of the public library as a whole to me using 2.0 web tools is just talk. Know your community and do whatever it takes to keep them happy with your services. To me thats it. Stop wallowing in a mire of paralyzing professional introspection and act to please your customers. Permalink Submitted by Anonymous (not verified) on May 27, 2010 - 10:47am. >For myself, I don’t feel that there is a coherent macro-level debate. OK, at a macro level what do you want done? 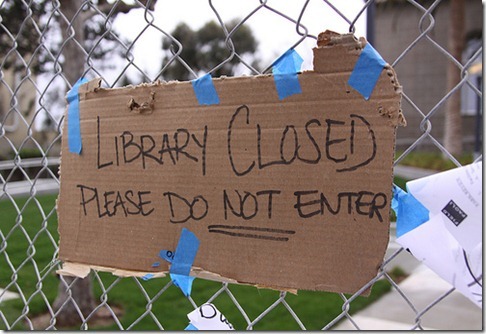 What do libraries need to do at a macro level? Lay out your ideas and lets discuss. Permalink Submitted by Anonymous (not verified) on May 27, 2010 - 5:26pm. I may be going out on a limb here, but does any one else feel that posts like these are out of the scope of LISNews? I'm kinda getting tired of folks that put up blog posts on what is a news site. If I wanted to read your commentary, I'd go to your blog. Permalink Submitted by Bibliofuture on May 27, 2010 - 8:56pm. It looks like Andy created this as a blog post. Blog post show in the right hand column. I believe Blake has given several people the power to promote stories to the main column. If a blog post is promoted it shows that one of the LISNEWS authors thought it was noteworthy for some reason. I did not promote Andy's blog post but I would agree that it was noteworthy. I don't think LISNEWS authors should promote their own blog post to the center column. I personally like to see blog post on the site that generate discussion. Although the name of the site is LISNEWS I think the scope of the site has been broader than just news for several years. Having LISNEWS authors bring in posts from a wide range of sources with numerous viewpoints and agendas is one reason I like this site. I would like to see more people use the blog feature on LISNEWS and share their ideas and viewpoints. Whether these blog posts get promoted to the center column is a separate issue. I believe that in the last couple years I have promoted a blog post to the center column only 2 or 3 times. In the end the scope of the site is decided by Blake. From what he seems to allow I would guess that Blake has a wide scope envisioned for LISNEWS. Permalink Submitted by Anonymous (not verified) on May 28, 2010 - 4:28pm. here, here. I agree with most of what is written. having been in the profession from the old card files to virtual libraries, much has changed and the profession has not kept up. i'm put out by the "we've always done it this way" approach. too much of that has gone on. Where are state librarians and library schools in this? shouldn't they and ALA be addressing how libraries are different, how to refurbish funding avenues. maybe better ways of revenue streams that are more stable and state legislature safe. surely there are some better minds than mine who can come up with something. something like the tobacco tax % going to anti-smoking campaigns. A book sale tax (online & retail)? i hate to see libraries close but maybe that will alert the populace and governing bodies what we've been trying to tell them all along but weren't heard. Permalink Submitted by Anonymous (not verified) on May 31, 2010 - 4:18pm. I disagree with almost all of what you wrote. Our small village is a low income area. The next larger city is 15 miles away. Many do not have the means to travel there for any activities or research. There is nothing here to serve the residents other than the library. Our summer reading program is outstanding and gives children something to do to keep them out of trouble. Contrary to popular belief, not everyone has a computer at home. I could go on and on but I will just say this. I would gladly pay the utilities out of my own pocket just to keep our library open. That is how important it is to our little community. Permalink Submitted by AndyW on June 1, 2010 - 10:24am. I am not pushing for a massive closure of public libraries, regardless of circumstance. If your little library has the support of the community, the local government, and an adequate funding source, of course it should be kept open. It would be a model for outreach, advocacy, and financial security. My overarching point is about libraries that basically function under subsistence funding: barely enough to stay afloat and certainly not enough to expand or improve their services and materials. At what point does the profession say "enough"? It is a question that a librarian should ask themselves: do they want the constant stress of worrying where the next funding check is coming from, or is this a situation that has improvement in the visibly future? Keeping it open simply for the sake of keeping it open is not a viable option, in my opinion, and it warrants examination as to whether it would be better off closed. Again, this might not be true with your library, but I'm can think of a couple libraries in my area where it is. Permalink Submitted by Anonymous (not verified) on June 1, 2010 - 10:25am. What decimation means in real-life land is that people with the most seniority (in union libraries), or administration pets (in non-union libraries) will keep their jobs until they retire. The young people that are needed in this line of work will get put out, and will find another line of work. The troublemakers--exactly the kind of people who are needed to question the status quo--will be looking for other work, too. Permalink Submitted by Anonymous (not verified) on June 1, 2010 - 12:36pm. It is typical of my fellow librarians that such a thougt-provoking blog post would be followed by conversational digressions about grammar and ILL practices. The author threw down some serious challenges to our continued existence and, uncertain about how to react, some of us retreat into unimportant details. Here's my recommendation for improving public libraries: think outside the MLS box. Forget about trying to fix library school programs-- that's the long way around the mountain. Hire in from other professions and other environments. Go for a little hybrid vigor! Professional polish, problem solving skills, good customer service practices, and a flair for community outreach are more important than whether or not you've taken a course on serials management or collection development. Permalink Submitted by Anonymous (not verified) on June 1, 2010 - 3:09pm. I agree with the idea of looking outside MLS degrees only - I use more of the skills I learned while working as an office manager (aka secretary) in a University department while I was getting my masters than the skills I actually learned from my fancy (and expensive) degree. Working in a library system that was almost shut completely down a few months ago this article really hits close to home for me. We have been having funding problems for the last few years and people (librarians/ library staff/ and the public) are beyond frustrated and starting to get to the point of almost hopeless. First they tried to close 4 branches permanently - there was a huge public outcry and the branches were saved by a technicality in the city charter at the 12th hour. This past December all branches and regionals were going to be closed - we were so close to closing that arrangements were being made to pick up the pink slips for all 750 employees that were going to be laid off when funding came through at the last minute to keep us open. Now after being told there would be no more cuts to the library we are facing losing another 2 million in funding after losing 8 million last year. While in theory starting over would be great- the convoluted hiring policies would not actually give this system the ability to hire the best people for the positions - instead we would end up with the same surly union protected library assistants who took a clerk exam and were shoved into the library system and librarians who start out enthusiastic but are eventually beaten down by the system. The reality is that the face of the library, unfortunately, is generally the undereducated and uncaring library assistants who couldn't care less about the library. This problem is larger than just the libraries and more the problem of a large civil service hiring process, unfortunately this issue wouldn't be resolved with the closing of libraries and I have a feeling that this is the case in a lot of large civil service library systems. Permalink Submitted by Anonymous (not verified) on June 1, 2010 - 4:56pm. I would disagree with your closing comments. Yes, the "library assistants" are the face of the library. I have found that a majority of those library assistants and paraprofessionals are the ones most in touch with what's going on in the library and the patrons' needs/wants. The management sit in offices all day trying to think of ways to be relevant. What good is any degree, MLIS or otherwise, if you don't understand the patrons? Permalink Submitted by Anonymous (not verified) on June 1, 2010 - 1:47pm. Funny you talk of "seeing the forest for the trees", yet the MLIS degree and library school issue is only one facet of the problem. Permalink Submitted by Anonymous (not verified) on June 1, 2010 - 4:18pm. Permalink Submitted by AndyW on June 1, 2010 - 6:55pm. My post extends up and down the staffing spectrum, from the highest director to the lowest student assistant. I didn't exclude anyone from consideration (or, in this case, blame). So I'll pass on the egg sucking for now. Permalink Submitted by Anonymous (not verified) on June 1, 2010 - 9:09pm. You're right. There are people at all levels that are resistant to new ideas. The problem is that at the top, there is no accountability. I can't tell you how many good, proactive outreach ideas either got strangled in the crib by our top brass, or had to be done by skirting around them. Permalink Submitted by AndyW on June 1, 2010 - 9:35pm. It's not a problem unique to libraries. Bad adminstrators and executives get passed from position to position without repercussion or recourse. A resume doesn't reflect the damage bring or do to an organization; so they get hired, create discontent, and then move on clueless to the harm they bring. I have an idea of what you mean, based on what I have heard from my peers. Permalink Submitted by Anonymous (not verified) on June 1, 2010 - 8:46pm. ... and that's the trouble with librarians. They are folks who failed at the jobs they really wanted to do, so they took the job of a clerk. Librarians are glorified clerks. Get over it. Journalists sure are having to get over their issues. Right? oh the glory of the profession. That's why I do it! Permalink Submitted by Anonymous (not verified) on June 2, 2010 - 8:30pm. It's similar to most other professions, except the median income is much lower for a position requiring a graduate degree. Most of our full-time librarians are in management or have instructional roles. I'm sure there are many in the World today finding their work economically obsolete; obviously writers, grammarians, and plenty of others with simple, nasty opinions. Many of the librarians I know could do many other jobs quite successfully. Permalink Submitted by Anonymous (not verified) on June 3, 2010 - 4:01pm. Permalink Submitted by Anonymous (not verified) on June 2, 2010 - 10:27am. After running a community library for a non-profit organisation in Africa I learned the difficult (but also fun) way that libraries waste unnecessary funds on things they hold sacred - but aren't sacred. For example, why do they cover books in plastic? Waste of time. Wast of money. More gunk in the landfills. The plastic photodegrades faster than the book does. Most books are just fine without it - after all, they're not wiping each book returned with sanitizing-deodorizing-sedatives are they? Here's another example: why do libraries buy new publications from publishers or agents or bookstores? Why don't they buy gently-used books? Our entire library has as a monthly budget of ZAR350 (about US$45) and we have 3800 patrons and another estimated 4500 regular users (and 2 librarians!). How is this possible you ask? Because we buy second hand books, receive donations (which we sort strongly and use some of to swap at book-exchanges). And because we're dedicated to principals like 'trees are more important than books' and they are. Why is every other business under pressure to be more environmentally friendly, to cut costs while developing benefits, but not libraries? Permalink Submitted by Anonymous (not verified) on June 3, 2010 - 10:45am. I am not knocking your non-profit work for African Libraries, but in my public library in Illinois, the patrons (people that pay hard-earned taxes to support our library) would generally be pretty dissatisfied if we waited that long to get a new book on the shelves. There is no way we would wait for a copy to appear on the second-hand market. Now, if you want to argue that we should not be buying physical copies but instead be utilizing e-books, that's a different matter. Permalink Submitted by Anonymous (not verified) on June 3, 2010 - 10:56am. >would generally be pretty dissatisfied if we waited that long to get a new book on the shelves. I have seen plenty of libraries that buy new books that never get read. I am ok with buying new books that there is specific demand for. But for fiction books with no specific demand wait two months and the price of the book on the secondary market will be real low. Permalink Submitted by Anonymous (not verified) on June 2, 2010 - 11:01am. As an MLS librarian, I worked many years in PA and then came to NJ five years ago. It's my perception that the failures of advocacy you point out are really an outstanding feature of the NJ library landscape. I'm not sure why that should be, but when I compare the Pennsylvania Library Association and even ALA with NJLA for activism, I'm baffled by the lack of activism. Is there some deepseated concern that being activist will doom library funding? Permalink Submitted by Anonymous (not verified) on June 2, 2010 - 12:13pm. and look forward to ways to better my services to our patrons. If that process involves change, so be it. Closing of a library is limiting the enrichment of individuals who use that library. The library is not just a building or institution, it is "an agent of change" that is constantly developing. Permalink Submitted by Anonymous (not verified) on June 2, 2010 - 7:41pm. Permalink Submitted by Anonymous (not verified) on June 3, 2010 - 11:58am. And what about the talented workers who run the library - Librarians and circ staff alike? It is NOT fine to toy with pensions, interrupt mortgage payments and rent and then start them back up again whenever. These are people with lives and families who depend on them. Revamp? Sure. But don't unnecessarily drop people from the payroll when they have served the public wonderfully for years. Permalink Submitted by Anonymous (not verified) on June 6, 2010 - 4:07pm. This is an accurate description of the state of libraries today and the changes that must be made to keep them viable. Each point is applicable to our situation in Hood River, OR where a ballot measure to create a library taxing district just failed. We are in the midst of trying to figure out what we will do now and it is already clear that change is hard. Keep the ideas coming. They are helpful. Permalink Submitted by b00gertoad on June 9, 2010 - 9:05am. I confess, you had me at transliteracy and CS so I pretty much stopped reading there. Permalink Submitted by Anonymous (not verified) on June 23, 2010 - 1:21am. Part of the reason lousy librarians are able to keep their jobs is because many places operate on a seniority system. Thus, the ambitious new librarians (the ones who want to make our industry better) would be the first ones let go if more libraries were to close. Then there's Penny (not her real name, obviously). Sally's been in the system for ten years and does nothing. She hosts no programs, orders no books, does no weeding, doesn't care about helping people...nothing whatsoever. She does two hours a day on the Reference Desk, pulls her holds and plays online puzzles the rest of the day. She has even told me that her goal is to do even less! To People like Penny, being a librarian isn't about helping people. It isn't about delivering great customer service. It isn't about making our library the best it can be. It's about clocking in, clocking out and getting paid for the time in between, while doing as little as is humanly possible. If my library system were to close my branch, I will be let go before Penny is, because I only have three years in the system. I'm working hard, every day, to make a difference in the system and I would be kicked out, while Penny, who is only there to collect a paycheck and kill time until she can go home to her cats, would remain. So I must disagree with you that closing more libraries would squeeze out the dead wood like Penny. In fact, it would have the opposite effect on my system: it would force out all of the younger librarians like me, who want to make the system better, faster, more responsive and smarter.